A "natural person" is considered to mean any natural or legal person who makes an order with Bruno Bandelier validated via a secure payment platform (Paypal or other), or by check, bank transfer or cash. The only version of this document implying a contractual agreement is that available, up to date, on the site https://karate3g.com/cgv/. Any order placed on a site belonging to Bruno Bandelier implies the full and unreserved acceptance of these terms and conditions of sale. Prices are quoted in euros all taxes included, excluding postage and processing your order. The price of items can be changed at any time. However, the rate applied to an order will be the one announced at the time of the order. Payment is due immediately on the date of the order, including pre-order products. You can pay by credit card via Paypal (or other secure payment platform) or bank check or by transfer or in cash. Paypal has accentuated its verification process to fight against fraud, the company can not verify that you are the cardholder and the only solution is to create an account PAYPAL. It is not very complicated, you only need to record your references and those of your credit card once, via their secure platform. This will also allow you to buy easily and securely on many sites that work with this payment method without having to re-communicate your references, simply with your credentials. For the payment of subscriptions via Paypal, the creation of a Paypal account is mandatory. PayPal users can provide payment via funds from their PayPal account or PayPal-approved credit card. Orders paid via PayPal funds or Credit Card will be immediately available for delivery. Refunds for transactions paid via PayPal are refunded to your PayPal account only. We are a verified PayPal seller. Paypal takes into account the cards: CB, Visa, Mastercard, American Express, Carte Aurore, Cofinoga, Cofidis. If you wish to pay by check, simply choose the payment by check when it is available on the order page and validate. You will then send us your payment indicating your name, first name, address and reference of your order. Payment by check is only possible for checks in euros drawn on a bank domiciled in France. The check will be cashed before shipping the order, unless exceptional agreement confirmed by Bruno Bandelier. If you wish to pay by bank transfer, simply choose the payment by bank transfer when it is available on the order page and validate. Our bank details (RIB) will be sent to you by e-mail with your invoice. Your order will be processed and shipped upon receipt of your transfer by our bank. The delivery is made to the address you indicated when placing your order (therefore, pay particular attention to the spelling of the address you enter and especially to the postal code). The risks will be at your expense from the date on which the products ordered have left our premises. However, in the case of a lost package, we will do everything necessary to ensure that you receive your product anyway or that you are reimbursed according to your guarantee. For products "Pre-order", ie those that you can buy before their official release, the payment is due immediately at the time of the order. The projected dates of publication of the products are not contractual. We do our best to meet the projected dates we specify, however the actual dates often depend on factors beyond our control (eg print times, DVD pressing, natural disasters). If you are impatient and you intend to send us an email every day to find out if the product you have pre-ordered is out, we will refund immediately to have a little peace. If you want to be absolutely certain that your product will be shipped on a specific date, DO NOT MAKE PRE-ORDERS. Just wait until the product is officially released, it will save everyone unnecessary stress. In accordance with the legislation in force, you have a period of 7 days from receipt of your order to exercise your "right of withdrawal". However some of the products and services we provide are not subject to this right of withdrawal, but, in order for our customers to have no problem, we have made the following decision: all our products and services without exception benefit from a guarantee of satisfaction. Unless otherwise stated on the product description page, all our physical products have a satisfaction guarantee of 30 days. If you are not satisfied within 30 days of your purchase, return the product NEW STATE to be refunded in full (including postage). Unless otherwise stated on the product description page, all our electronic products have a satisfaction guarantee of 60 days. If you are not satisfied during the sixty days following your purchase, simply contact us by email or mail as indicated above and ask for your refund by mentioning your transaction number. Unless otherwise stated on the subscription page, all our subscriptions have a satisfaction guarantee of 60 days. If you are not satisfied during the sixty days following your subscription, simply contact us by mail or mail as indicated above to request your refund. Renewal subscriptions by tacit renewal may be terminated at any time. The termination will be effective on the due date of the subscription following the date of termination. To cancel your subscription, simply contact us by email or mail as indicated above to request the cancellation of your subscription. If your request for termination reaches us within the 30 days preceding the due date of your subscription, and we have not had time to cancel your subscription before it is renewed automatically, we will proceed to the automatic refund this renewal within the 30 days following your request for cancellation and will proceed to the effective termination of your subscription. example: You are subscribing to 1 for the 24 / 02 / 2018 and you are requesting the termination of your 20 / 02 / 2019 subscription. We will do our best to satisfy you but, as the deadline is very short, if your subscription is automatically renewed the 24 / 02 / 2018 and your account is debited, we will refund you automatically before the 20 / 03 / 2018. The guarantee of satisfaction of 60 days is also renewed by tacit renewal, that is to say that during the 60 days which follow the expiry of your subscription, you can request the refund of your deadline by contacting us simply by mail or mail as indicated above. In the event of receipt of defective or non-compliant products, we undertake to replace you, or refund the amount of the products ordered. Contact us to be given the information of return in advance. We return the defective or non-compliant products with the corresponding invoice (or at least the transaction number). We will refund the cost of return if you return your order for a reason that is attributable to us: delivery error, defective item. Return shipping costs will also be refunded if you return your order because you have changed your mind (Please send us the invoice for your return shipping costs). A refund will be made by check, Paypal or transfer (attach a RIB) within 15 days from receipt of the package. In case of unavailability of an item for a period of more than ten working days, you will immediately be notified of the foreseeable delivery times and the order of this article may be canceled on request. The customer can then request a credit for the amount of the item or refund. The photos of our electronic products are "presentation suggestions", ie the images do not always correspond exactly to the product you will receive in the end, especially for pre-orders, where the visuals are not always final. In accordance with the Data Protection Act of January 6 1978, you have a right to access and rectify personal data about you. Our activity is declared to the National Commission of Computing and Freedoms (CNIL) under the number 1723520 and we respect the law Informatique et Libertés. By entering your email address on one of the sites of our network, you will regularly receive emails related to the subject of the list on which you have registered. You can unsubscribe at any time. All you have to do is click on the link at the end of our emails. 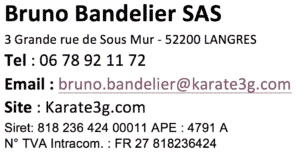 The newsletter allows you to receive advice on karate, by sending information emails and / or promoting products or services (mine, or those of my partners if we consider that they are of quality and that they can be useful to you). You must provide first name and your email address in order to register. No email or first name: no newsletter or video. Your email address will never be sold or shared with anyone. You can access your personal data and unsubscribe from the newsletter of the site through a link at the bottom of each email sent. The recipients are the people registered to the newsletter, the publisher of the site and its subcontractors. For purposes of monitoring and operating our sites, we inform you that cookies may be installed on your browser. In any case you can freely delete them from your browser. In our newsletters, communications, and websites, we may recommend tools, websites, products, or service providers that can provide you with a useful supplement to our services. When this is the case, we are usually partners of the companies that market these products or services - so we receive a commission if you decide to purchase these products or services on our recommendation.